Koos Vrijlandt (pictured above) has been made global account manager for Heineken Global Duty Free with overall responsibility for cruise lines, one of the company’s key channels within duty free. A well-known figure in travel retail, Koos takes on this role from his previous position managing the European ferry sector. 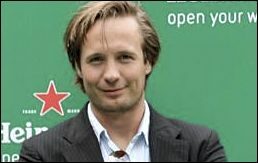 Based in Amsterdam, he will focus on Heineken’s portfolio ambitions for the growing cruise market. Reporting to Koos is Nick van Buuren as sales representative responsible for cruise lines in Europe, who is also new to the team, and Alex Godinez already well known in the industry and responsible for the wider Americas cruise line business. Onno Huyghe (pictured below) has joined the duty free team as global account manager for north west Europe and ferries. Previously he was the area export manager for the Baltic States and Finland. With Heineken since 2008, his expertise is in key account management, seeding and growing brands both directly and through ag ents. Reporting to Onno are Andre Annick who is the sales representative responsible for the Nordic region and, new to the team, Merel Tempelaars who is the sales representative responsible for Western Europe. Sean McNaughten, manager Heineken Global Duty Free comments on the appointments: “I’m delighted that we have two such strong leaders in these critical sectors of our duty free business, where we have a unique opportunity to introduce new audiences to the Heineken brand and our wider portfolio of beer, ciders and craft beers.